Students create a visual, could be Google Slides of an archetype from a film or previously read story. Students can make the connection to the idea of archetypes by identifying some they are already familiar with. I start this lesson with a discussion of the Ford Model-T and how all other cars are modeled after it. We identify the characteristics that the Model-T shares with modern vehicles such as windows, wheels, steering wheel, etc. 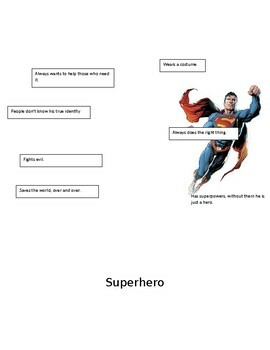 We then move on to discussing superheroes, most students will mention Superman and we discuss the traits that make him a super hero, he flies, wears a costume, always gets the girl, etc. We identify other superheroes we can compare him to. We create a graphic organizer (bubble map) as we discuss to ensure students remember what an archetype is and the examples discussed. We move on to discuss setting archetypes such as the haunted house, dark forest, castles, etc. I do not provide a list of archetypes as I find this overwhelms students but several lists are found online. 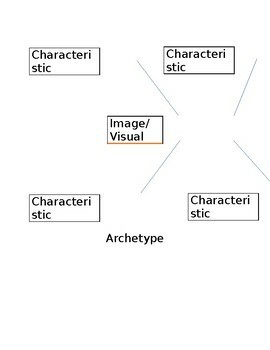 Students are then instructed to identify an archetype form a movie or story they've read and create an image that represents them along with a list of characteristics that make them that archetype.